Egypt, Sudan, and Jihad are much in the news today. What follows is a brief overview of some of the history behind the news. We begin with “Part I: The Mahdi’s world: Social and Political Conditions”, which is followed by “Part II: The Mahdi’s world: Slavery, Bedrock of Sudan’s Economy” and “Part III: The Mahdi: The Rise and Fall of the Mahdist State”. This blog series was written by Judith Schaefer, volunteer in the Warren M. Robbins Library, National Museum of African Art. 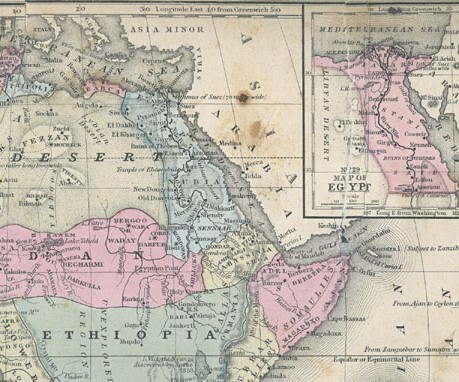 “Precolonial Africa, 1858.” Note that the borders depicted are only suggestions based mostly on geography and ethnicity. Mitchell’s School Atlas, 1863. Courtesy the private collection of Roy Winkelman. The Illustrated London News. London: March 8, 1884. Hicks Pasha’s army staggering toward El Obeid—and death. Battle of El Obeid. In September, 1883, Colonel Hicks, a British soldier hired by the Egyptian Khedive to put an end to the Mahdist threat, set out from Khartoum for El Obeid full of misgivings. 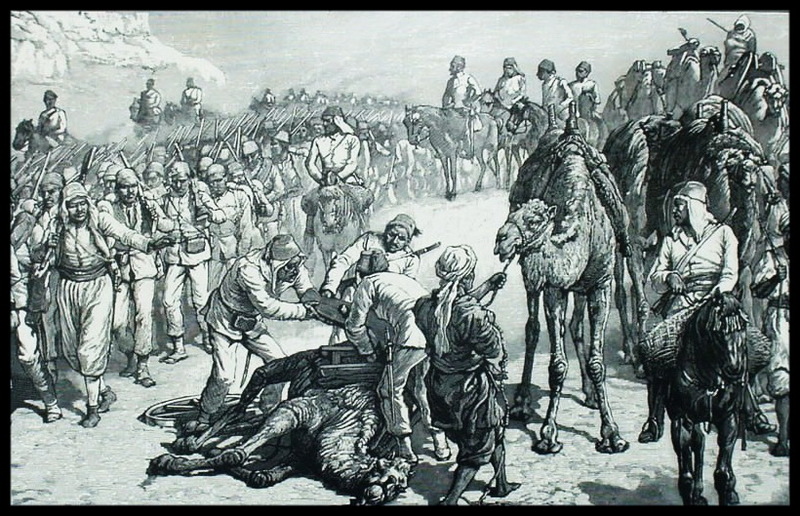 His undisciplined, untrained army of some 8,000 Egyptian infantry, 1,000 cavalry, and 2,000 camp followers (plus a few Europeans, including journalists), with 5,000 camels to carry the baggage and assorted firepower, soon ran into trouble. The “arid wastes” were the first enemy—burning heat and lack of water brought misery and defections; even the camels were at their limits. On November 5, finally nearing El Obeid, this ragtag force ran into a Mahdist ambush and was nearly annihilated—7,000 dead, 2,000 or so taken prisoner, few survivors. Hicks was among the last to die, falling to a well-thrown spear. His head was cut off and sent to the Mahdi. The Mahdi’s success emboldened others to join his revolt against the Turkiyya, as Turco-Egyptian rule was known, and soon the black, green, and red flags of jihad were flying from the far reaches of Sudan’s western desert to the shores of the Red Sea. But let’s back up: Why, in 1883, was a British soldier leading an Egyptian army into the wilds of Sudan to destroy a Sudanese holy man and his followers? In 1881, a rebellion, a jihad, in fact, broke out against Turkish rule in Sudan, led by Muhammad Ahmad, a charismatic Sufi holy man who claimed to be the Mahdi, a direct descendant of the Prophet and savior of Islam. What follows is brief account of that violent uprising, beginning with a background sketch of the conditions in Egypt and Sudan that gave rise to it and continuing with an account of the Mahdi and his jihad. The focus is on two institutions, one political (the Turco-Egyptian Caliphate) and one economic (the slave trade); and on five men who played key roles in the eventual catastrophe: Muhammad Ali and Isma’il the Magnificent, Khedives of Egypt; Sir Samuel White Baker, Governor-General of Equatoria; Al- Zubayr Rhama Mansur, slave trader; and Muhammad Ahmad, the Mahdi. The complete story is so complex, so dramatic, so full of fabulous wealth, extreme brutality, monumental injustice and corruption, and larger-than-life men (and one woman), both African and European, that only the barest of bones can be presented here. Do head for the library yourself to read more—you won’t be disappointed, and you’ll gain a better understanding of contemporary events in that part of the world and in the Middle East as well. The Warren M. Robbins Library, National Museum of African Art, has a fine collection of works on African history, from 19th century illustrated volumes of exploration and discovery in English, French, German, and Portuguese, to modern scholarship in books and journals. Stop by and take a look. 1517 -1914 Rule of Ottoman Turks, also Sunni; lasted in various forms until 1918. 1798-1801 A French interlude during the Napoleonic Wars. 1801 Restoration of Ottoman rule. 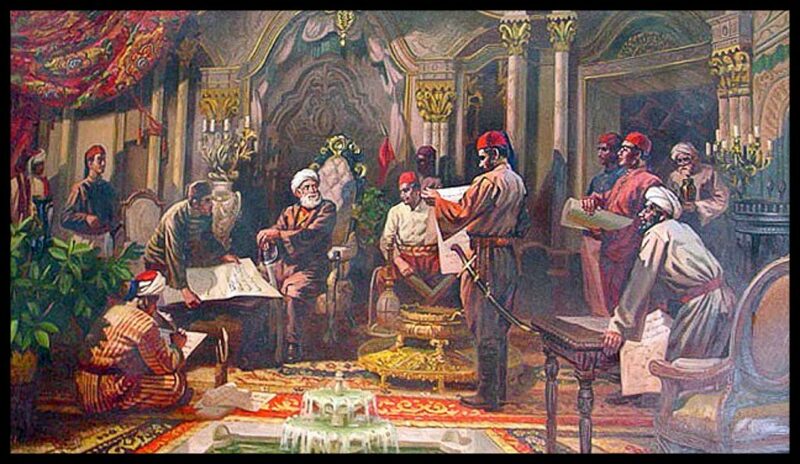 1806-1881 Turco-Egyptian Caliphate 2 declared by Mohammed Ali Pasha, self-declared Khedive of Egypt; Sunni, Bektashi sect. 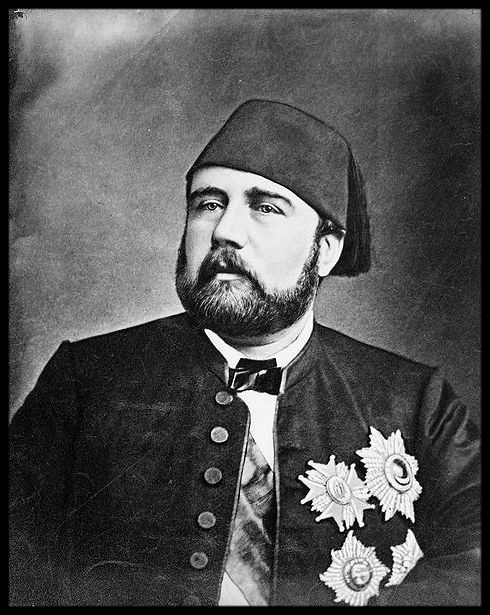 1863-1879 Turco-Egyptian Caliphate: Isma’il Pasha, a grandson of the Khedive. 1881-1898 Mahdist rule in Sudan. Muhammad Ali Lithograph by Louis-Dupré in 1830 c. Frontispiece of the edition: L’Égypte et la Nubie, by Édouard-Pierre-Marie de Cadalvène & Jules-Xavier Saguez de Breuvery, Paris, Arthus Bertrand, 1841. Collection of Actia Nicopolis Foundation, Preveza, Greece. In 1801, the Sultan of the Ottoman Turkish empire sent a military force reoccupy Egypt after Napoleon’s departure; its leader was a Commander in the Turkish army named Muhammad Ali. 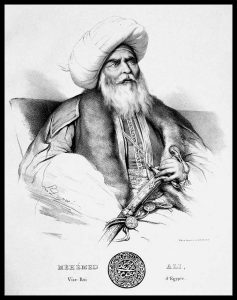 In 1805, this ambitious officer managed to oust the remaining Mamluks (one effective tactic was massacre) and declare himself Khedive, or Viceroy, of Egypt, an outpost of the Ottoman Caliphate. Realizing that to compete in the modern world Egypt would have to modernize along the lines of a European-style state, Muhammad Ali began to innovate. He established a professional bureaucracy and a modern military; he developed industry—the production of guns and gunships and also textiles made of Egyptian cotton, a plant he introduced from the upper Nile valley. He hired European managers to train his bureaucracy and founded a sort of medical school to train female doctors so that women and children would receive better health care. Education of the elites was crucial—he sent many to Europe, mostly to France, to study. He supervised the translation of many French texts on a wide range of subjects into Arabic. He established the first press in the Arab world, a gazette that published his regime’s achievements. The downside: To finance the state, he nationalized all private landholdings, thereby monopolizing commerce in the products of those lands. He also used forced labor, an unpopular tactic to say the least. And by all accounts, he was despotic, brutal, and cruel. Mohamed Ali’s opulent lifestyle was legendary. His main residence in Cairo was a complex called the Citadel. This is the site of the Mamluk massacre; he had invited them, his erstwhile enemies, to a feast and as they were leaving the complex he had them slaughtered—four hundred and seventy of them. Below, the throne room, where he is said to have awaited the results of his bloody plot. Below is a view of the fountain court as it looks today. The ceilings are painted with decorative flora patterns and portraits of Muhammad Ali and his sons set in medallions. The central marble island of the water basin was used as an opera stage. Surrounding the pool is the cloister-like pavilions, all of white marble, exquisitely sculptured in a neo-classical style. 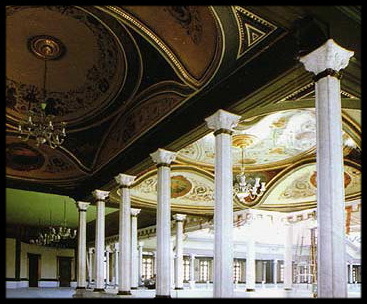 Muhammad Ali’s Shubra Palace,” by Lara Iskander. Muhammad Ali’s foreign adventures included the conquest of the Arabian Peninsula, Syria, and Crete, and he anticipated an eventual fight with his Ottoman overlord. All this cost money; to refill his coffers he looked to the south and, in 1821, annexed the upper Nile valley (where the future Mahdi’s family lived), sometimes called Nubia. Soon its Arabic-speaking inhabitants, mostly Sufi Nubians—merchants, traders, craftsmen, and farmers—were seething with resentment. In their eyes, the Egyptian elite wallowed in luxury, spoke Turkish (or, even worse, French), and were seen as infidels (wrong sort of Islam); taxes were crushing, corruption rife, justice absent. Worse, European Christians, taken on as advisors and governors, were given too much power and influence. Finally, most serious of all, attempts to abolish the slave trade threatened the bedrock of the their economy. This modernizing Khedive, who loved European technology, wealth, and education, did not embrace its notion that slavery was immoral and should be abolished. In 1823, needing to bolster his army, Muhammad Ali wrote to one of his commanders in Sudan, “You are aware that the end of all our effort and expense is to procure Negroes. Please show zeal in carrying out our wishes in this capital matter.”3 His “wishes” caused the slave trade to increase dramatically, from an estimated 1,500 slaves per year at the beginning of the century to as many as 60,000 per year in the 1860s. The site where the Khedive garrisoned his troops, founded in 1841 near the confluence of the White and Blue Niles became known as Khartoum. (Three years later, some two hundred and fifty miles to the north as the crow flies, on an island in the Nile, the Muhammad Ahmad, the future Mahdi, was born to a family of boat-builders, who claimed to be descendants of the Prophet.) Khartoum quickly became a major market for the luxury goods streaming out of central Africa, such as ivory, rubber, ostrich feathers, gold, rhinoceros horn, ebony, and, increasingly, slaves. Until 1843, the Khedive had a state monopoly on slave trading. Thereafter, seeming to bow to European pressure, the government withdrew active participation and simply sold licenses to other traders—Arabs and even Europeans. Muhammad Ali died in 1849 after several years of declining health. His immediate successors mostly maintained the status quo, except that, in 1854, pressured by the British, Cairo ended state participation in the slave trade and then, in 1860 abolished it; neither edict was enforced, but the die was cast. Muhammad Ahmad, then sixteen years old, already felt the call of the religious life. 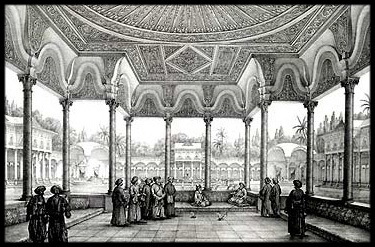 In 1861 he began training with a prominent Sufi Sheik and stayed with him for seven years. When he began life as a preacher, already known for extreme piety and asceticism, Isma’il the Magnificent had been in power for five years. Ismail the Magnificent. Anonymous, Association du Souvenir de Ferdinand de Lesseps et du Canal de Suez. Muhammad Ali’s grandson, Isma’il, educated in France, was Khedive of Egypt and Sudan between 1863 and 1879. Under his rule, Westernization continued apace: he stimulated commerce, remodeled the postal system, built railroads, oversaw the Egyptian portion of construction of the Suez Canal (opened in 1869), built a theater and opera house (Verdi’s Aida had its glittering premiere here on Christmas Eve, 1871), and entertained lavishly, imitating the Parisian belle époch. European notables, foremost among them Empress Eugénie of France, intrigued by the vast wealth and exotic lifestyle (in which harems featured prominently), flocked to Alexandria and Cairo. All this was expensive. At first cotton exports helped pay the tab—prices had soared because Europe’s normal supply, from America, was cut off by the American Civil War. But the war ended, and the bubble burst. Isma’il came to depend on even more crushing taxation—to be paid sometimes in slaves, gold, and horses–and he levied a poll tax on everyone, even the nomadic tribes. For merchants there were taxes on trade and imports; a peasant farmer paid a poll tax for himself and each member of his household and also taxes on his land, his consumption, on his place at the market, on his sales—even his water wheel—indispensable for irrigation, was taxed. And at every level, an official had to be bribed. Failure to pay up incurred terrible punishment. The violent, unscrupulous tax collectors lashed delinquents with whips of hippopotamus hide, sometimes burned their huts, sometimes strung them up by their thumbs, sometimes tied them naked to the ground in the burning heat. In the villages, they also took for themselves whatever they wanted—women, livestock, food. This extortionate taxation caused many men to abandon their land and take up trading, including trading in slaves. Meanwhile, Ismail carried on with his dreams, the greatest of them being the construction of the Suez Canal—his triumph and his undoing. 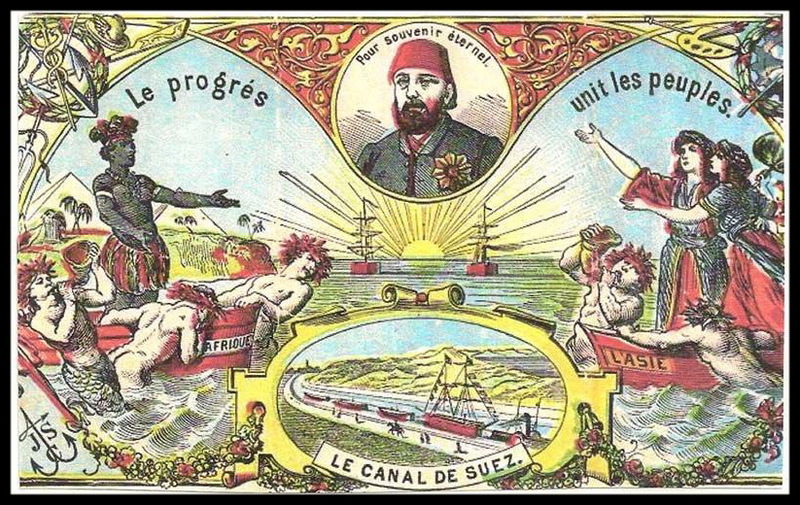 The Suez Canal, a joint venture between France and Egypt, opened officially on January 11, 1869. Would the future Mahdi, then twenty-five years old, have seen this contemporary poster? Would he have learned of the nearly unimaginable extravagance attending its opening—the new opera house, the new palace for Empress Eugénie, the festivities on opening day including a banquet for the 7,000–8,000 invited European royal and imperial guests, intellectuals, journalists, and various civil and religious dignitaries prepared by some five hundred imported chefs, the night skies filled with fireworks and the sounds of cannon fire? A dazzling success, maybe, but one paid for with borrowed money. Ismail had turned to foreign lenders to finance his modernization of Egypt’s infrastructure and the city of Cairo as well as his own lavish lifestyle, and state income from trade and extortionate taxation was insufficient to repay the debts. In desperation, Ismail put Egypt’s shares in the new canal on the market, and in 1875, Britain snapped them up. France and Britain, seeking to safeguard their other investments in Egypt, stepped up their intervention in Egypt’s financial affairs and ultimately, hoping for better governance, pressured the Ottoman sultan to dismiss Isma’il in favor of his son, Tewfiq, in 1879. In 1881, Mohammad Ahmad, long waiting in the wings down in Sudan, declared his intentions. Stay tuned for Parts II and III in this series. 1 Armies composed exclusively of slaves were a tradition in central Asia even before the Islamic conquest; the rationale was that slaves taken in foreign lands would be completely dependent on and loyal to the conqueror who enslaved them. They came to form an elite guard to protect the ruler against ever-present plots and rebellions. The slave army, institutionalized in the Abassid capital of Baghdad early in the 9th century and unique to the Muslim world, became a powerful political and administrative force, which persisted well into the 19th century and may be reflected in the great political power wielded by the military in some Middle Eastern Countries today. 2 A caliphate is a historical political entity governed by Islamic law and tradition. Collins, Robert O., and James M. Burns. A History of Sub-Saharan Africa. Cambridge: Cambridge University Press, 2007. Hill, Richard. Egypt in the Sudan. London: Oxford University Press, 1969. __­_. A Biographical Dictionary of the Sudan. London: Frank Cass & Co. Ltd., 1967. Holt, P. M. The Mahdist State in the Sudan, 1881-1898. Nairobi; New York: Oxford University Press, 1977. Hunter, F. Robert. Egypt under the Khedives, 1805-1879. Pittsburgh, PA: University of Pittsburgh Press, 1984. Mostyn, Trevor. Egypt’s Belle Epoch: Cairo and the Age of the Hedonists. London: I. B. Tauris and Company Ltd., 1989. Ring, Trudy, Robert M. Salkin, and Sharon La Boda, eds. “Khartoum (Khartoum Sudan).” International Dictionary of Historic Places 4: Middle East and Africa. Chicago: Fitzroy Dearborn Publishers, 1994-1996. Spaulding, Jay. “Slavery, Land Tenure and Social Class in the Northern Turkish Sudan.” International Journal of African Historical Studies 15, no. 1 (1982). http://www.jstor.org/stable/218446. Starr, Frederick. Lost Enlightenment: Central Asia’s Golden Age from the Arab Conquest to Tamerlane. Princeton, NJ, Princeton University Press, 2013. Wikipedia. “Muhammad Ali of Egypt.” https://en.wikipedia.org/wiki/Muhammad_Ali_of_Egypt Last modified July 7, 2016.